Discover the floating community, local temples and traditional food market of Danshui (Tamsui) on a walking tour of the 19th-century port city. Stroll with an informative guide down Danshui Old Street and sample local cuisine. You'll visit Danshui Longshan Temple and modern edifices like the Little White House for perspective on the city’s historical roots. Numbers are limited to 12 people on this small-group tour, which departs in the afternoon. The market is packed with stalls selling amazing food, but make sure to save room for Danshui's famous ah gei – a stuffed tofu pocket with a sweet and spicy sauce! 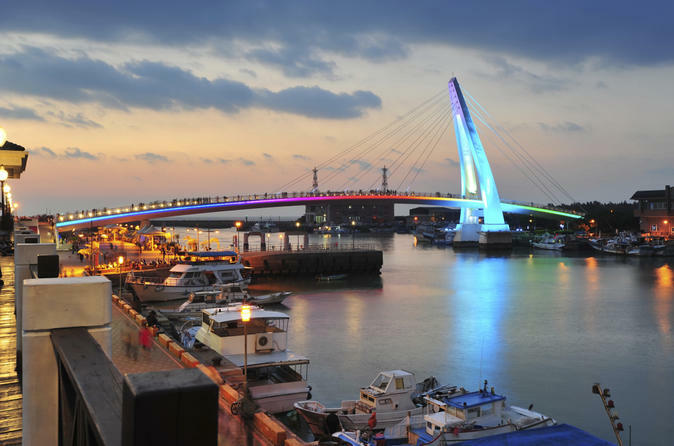 Prepare for plenty of walking on this 5-hour tour of Danshui, situated at the end of the MRT line outside Taipei. Meet your guide at Danshui station and set out on foot to main cultural attractions in the riverside city. Get a look at Danshui’s floating community, which harkens back to the 19th century. Your guide points out Community University, aka Shell Warehouse, then escorts your small group to a traditional market in the heart of town. Observe the bustle as local farmers ply their trade before continuing on to Danshui Longshan Temple in the middle of the market, and admire exquisite carvings at the nearby Danshui Master Temple. Then embark on a stroll down Danshui Old Street, lined with traditional red brick buildings. You’ll learn how local residents fought for their architectural preservation. View the Little White House, the former residence of the Danshui Tax Division, and visit Fort San Domingo, built by the Spanish. Finally, save room to sample Danshui’s specialty: ah gei, made with a sheet of bean curd stuffed with bean thread noodles and eaten with sweet or spicy sauces. In addition to fish ball soup, enjoy other snacks available to sample, like grilled squid, local biscuits and a selection of desserts. In the evening, walk with your guide back to Danshui MRT station, where you can either head back to downtown Taipei or continue exploring Danshui at your leisure.